Status of prototype(s): Two prototypes dumped. 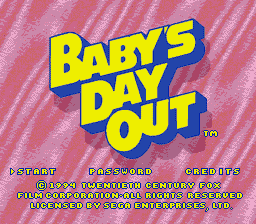 Baby's Day Out is an unreleased Sega Mega Drive game loosely based on its movie counterpart. In the game, you play as an angel and must guide the baby to the goal unharmed or getting kidnapped by the robbers. The developer, Designer Software, also created another unreleased Mega Drive game, based on the movie Beethoven.